The Syahi Imperator is a fountain pen from India that is made from Wenge wood and has gold-plated trims. Syahi (pronounced “si-ya-hee”) is the Urdu word for ink. This Indian company was founded by Sanay Shah and Aayush Bansai in 2017. 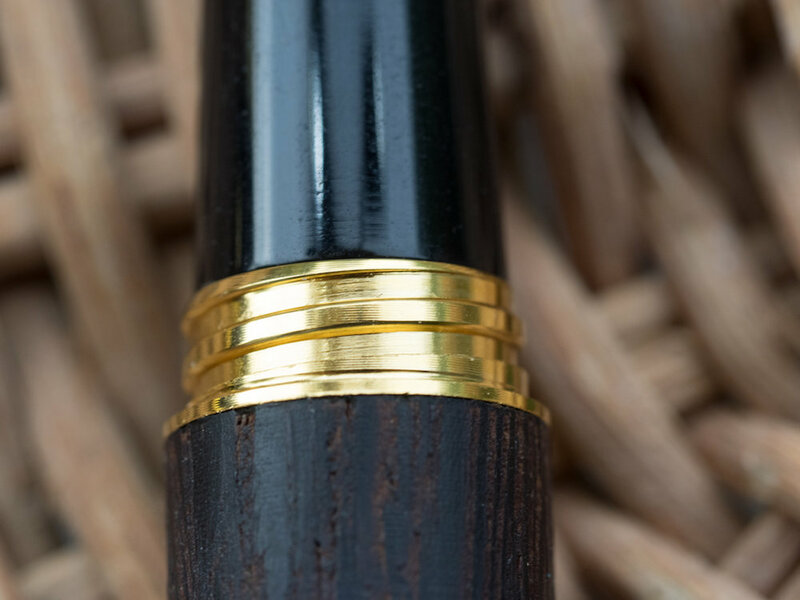 They craft their pens using kiln-dried heartwood, which is carved and then reinforced with brass and finished using natural oils. The model I’m reviewing is called The Imperator. It comes nicely packaged in a rectangular box with a pull-out drawer. 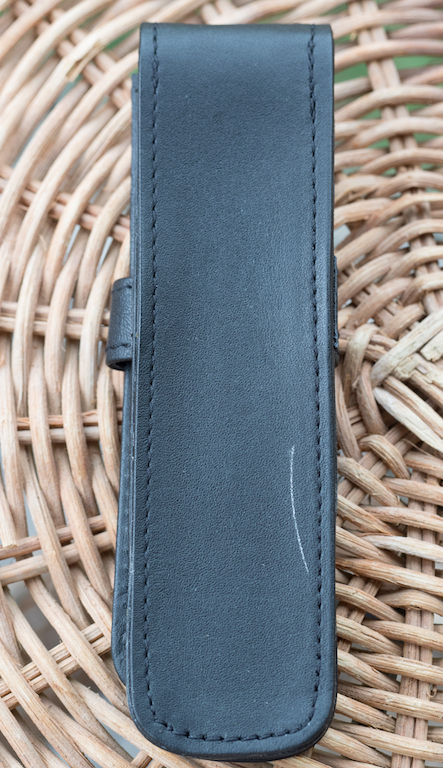 Underneath the pen you’ll also find a faux leather black pen pouch. Unfortunately my pouch has a noticeable scratch on the back. Still, it’s a nice accessory to include with a wooden pen. The Imperator is a large fountain pen, measuring 5.51 inches (140mm) capped and 5.11 inches (130mm) uncapped. Posting is not recommended because it will mar the wood. The pen has a flat top and bottom, which I really like since it sets the pen apart from the more common cigar-shaped pens. The cap is adorned with a 24k gold-plated clip and a large cap ring. The ring is engraved with “Syahi” on one side and the company’s logo (four nibs crossed) on the other. When you unscrew the cap, gold-plated threads are revealed. The inside of the cap is lined with plastic, presumably to protect the wood and also to prevent the ink from drying out (but see below). The threads inside the cap are plastic. Although screwing the cap on and off isn’t difficult, sometimes the threads didn’t catch immediately. At times the screwing motion felt a bit rough, as though the plastic and gold-plated threads had not been thoroughly sanded. The grip is plastic. At first I was a little disappointed that it wasn’t wood, because I love how wood feels. But, this design choice makes sense. When you dip the pen into an ink bottle to fill it, it’s inevitable that some ink will get on the grip. If it were made of wood, it would very likely stain. I’d rather have a plastic grip than take the chance that a saturated ink would permanently stain a wooden grip. The wood itself is a beautiful dark brown with lots of texture. Although it has been treated with sealant, it is otherwise unadorned. This wood isn’t shiny like it would be if it had been varnished. I like the matte finish, and over time the oils from my hands will give the wood character. The company states that the nibs are “German engineered,” but I don’t know if they are JOWO or Bock nibs. Regardless, the nib on this pen is beautiful and exhibits a good amount of line variation. Unfortunately, the nib is also quite scratchy, and it skips during lengthy writing sessions. The reason for this became apparent when I took macro shots of the nib. It’s clear that the tines are misaligned. I’ve also experienced hard starts every time I use the pen, even if it’s only been capped for a few hours. To get it flowing again I have to lick it (I know, gross), or, in some cases, I have to manually push ink into the nib using the converter. I’m not sure if the nib simply dries out when not in use or if the feed struggles to keep up with the ink flow, or both. The pen fills with the included screw-in converter or you can use cartridges. You can purchase the Syahi Imperator directly from the company. The Imperator with gold trims and a steel nib costs $169. You can get this model with brass trims for $10 less. If you prefer a gold nib, you’ll need to add $80 to the cost. Syahi also offers two other models: The Monarch and The Crown. Syahi pens are gorgeous wooden pens at a reasonable cost. The wood on the pen warms to your hand and feels very comfortable. Even though the pen is large, it is not heavy. The design elements on the pen are understated and classic. Although my nib is scratchy due to misaligned tines, it is a genuine semi-flex nib that offers excellent line variation when flexed. 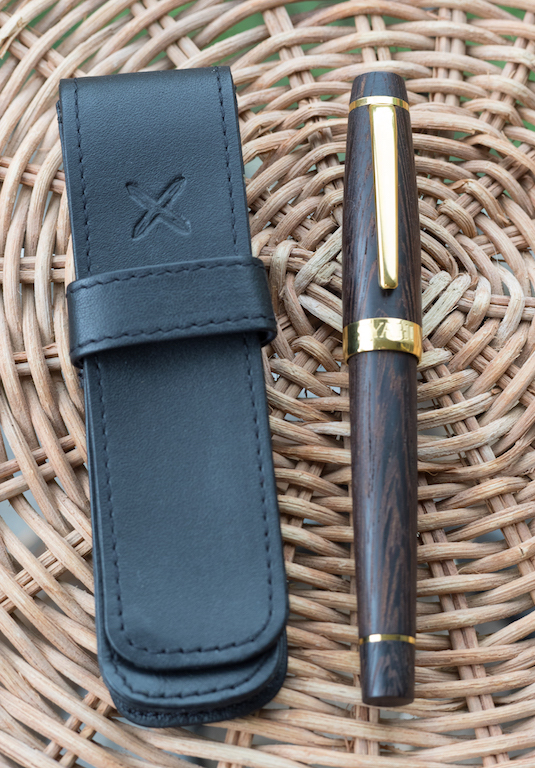 The pen pouch included with the pen is a nice accessory that helps protect your wooden pen. Unfortunately, the tines on my nib are misaligned, resulting in a scratchy writing experience and skipping. For some reason, the nib dries out between uses, even if only a few hours have passed. This means I have to get the ink flowing one way or another, which is an inconvenience. The threads seem to have a few rough spots when I cap and uncap the pen. Posted on September 21, 2018 by Susan Pigott and filed under Syahi, Fountain Pens, Pen Reviews.